In the six years that I have been advocating for the preborn, I've been increasingly troubled at what I've witnessed from the Christian community with regard to how they respond and react to the sin of abortion. The most troubling reality that I and other abolitionists across the country have been witnessing over and over is that there are more Christians who murder their babies in the womb than there are Christians who are or will genuinely advocate for the preborn and work to abolish human abortion. It is very heart-breaking to witness firsthand how a pastor simply refuses to speak up for his preborn neighbors. Nearly two weeks ago, after a brief email exchange with the senior "pastor" (Steve Ezra) from St. James United Methodist Church in Tampa, Florida, Steve reached a point where he would not answer my question to explain to me why he supports a church doctrine that allows women to have their preborn babies murdered. So I decided to visit the church today to see if I could get an answer from him. Does it Break your Heart that over 3,500 Babies are Murdered Everyday in America? Do you have any level of compassion for the thousands of preborn babies who are being brutally murdered every day in America? If your answer is, "yes" then when are you going to take action to advocate for them? If your cell phone service provider or your internet provider falsely overcharged your account, would you just pray for God to fix the problem for you or would you pray for guidance as you take action to advocate for yourself? If you start out just praying about the issue, how much of the wrongful overcharges would you continue to pay before you pick up the phone to get the issue resolve? Let's be 100% honest here. The truth is you wouldn't hesitate to pick up your phone to talk with a representative for as long as it took to get the issue resolved. Am I right? My message to the parents of the students at Prairie High School. It is a very real thing that about 1/3 of the moms and dads bringing their kids to the school have killed one or more their children. That means as mom or dad drives their son or daughter to class this morning, they are faced with the contemplation that they have killed their son's and daughter's sibling or siblings. A son has had his little brother murdered. A daughter has had a big sister murdered. And not just murdered, but murdered by their own parents. Our mere presence reminds them of this. The images of abortion on the sidewalk bring back the recollection of that son or daughter that was intentionally extinguished. And as they sit next to the one they didn't kill, they are now left with trying to explain this once abstract thing called abortion made real to both parent and child. Their response is often anger. Shoot the messenger for uncovering this foul and festering wound. Those who are part of the body and bride of Christ who make up the church of the living God recognize that the American church needs to wake up from their slumberous apathy and repent of failing to love (or even recognize) the plight of their pre-born neighbors. Those who have made an idol out of comfort, personal peace, spiritual affluence, and the esteem and opportunity provided to them by the institutional religious system, live to protect the way of the world and their place in it from any and all critique or exhortation. Such people "go to church" or make churches for themselves and see the church as an order or an edifice upon which they build their day to day justification and excuse their abandonment of true spiritual service and worship and steady sanctification. This video footage captures so vividly why abortion is legal in America. Are the Churches Guilty Again? For 41 years the American Church has been largely silent on America's Abortion Holocaust that has clutched the brutal murder of over 56 million babies at the hands of those who profit from their killing. Abortion is not a political issue or a social issue, but rather it is a sin issue and therefore a Gospel issue which makes it the business of the Church. I am with the Abolitionist Society of Tampa, Florida which is part of a worldwide Christian movement known as Abolish Human Abortion. We exist to abolish abortion in the city of Tampa, Florida and help spread Abolition throughout America and the world to make abortion unthinkable. 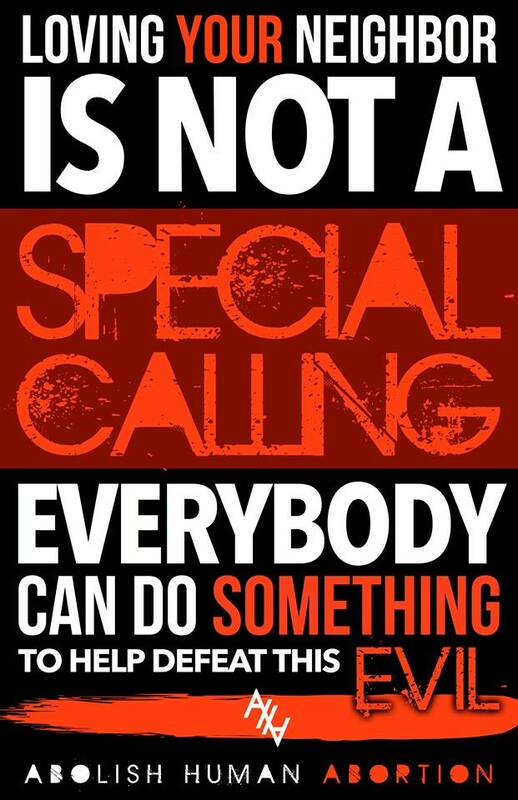 This can only happen through the preaching of the Gospel of Jesus Christ beyond the four walls of the church building and exposing the works of darkness by engaging our culture of death with the truth of abortion. In this we are obeying Christ’s command to make disciples, teaching them to obey all that Christ has commanded (Matthew 28:18-20; Mark 12:30-31; Ephesians 5:11). Abolitionists from all across the nation are taking part in a strategy known as Project Frontlines to expose the truth of abortion to our culture in a serious effort to abolish human abortion. This particular video footage above exposes how professing Christians believe that abortion should be legal. In Omaha, Nebraska, this teenager walked up to the abolitionist and proceeded to tell him that she is a "very strong" Christian; that she believes abortion should be legal; and that she believes that the "baby" is a parasite. At one point she named what church she attends and she also boasted of a recent mission trip she took part in from her church. neighbor. Visit www.ChurchRepent.com and get involved in abolishing human abortion. Say good bye to the sluggish, old-school pro-life movement! The Abolitionists are in town! We are all on fire and will not rest, nor ever compromise, in our mission work to Abolish Human Abortion and share the Gospel of Jesus Christ with this lost and dying world! The abolish human abortion Christian movement started a little more than two years ago. This past February, the movement launched a new strategy called, ProjectFrontlines.com. ProjectFrontlines came about as a result of seeing and practicing first-hand how frequently unsuccessful the work of sidewalk pregnancy counseling is as a means of actually putting an end to abortion. Many, many hours have been spent in front of the abortion facilities, pleading with men and women to not have their baby murdered. There are some success stories of men and women turning away from having their baby murdered, but unfortunately this line of ministry work does nothing to change the current culture's public opinion that abortion is a "woman's right to choose." "Your Images are too Shocking!" Yes, these pictures are of children. Brutally murdered children. Children formed after God’s own image and slaughtered in accordance with the laws of our land. Children who are your neighbors, your sons and daughters, and fellow human beings. We totally understand your disgust at seeing these images. We just don’t think you are disgusted enough. But we agree. We’re not fond of seeing these images either. But just look at what our apathy is allowing to occur in our so-called modern world. Consider how the institution of child sacrifice has more than ruined the days of over 55 million innocent children. That is to say… If you find these images to be depicting something so evil that high schoolers (many of whom play video games where they can put a gun to the head of a life-like human and pull the trigger or watch hours of TV depicting zombies eating brains or serial killers kidnapping and torturing teenage girls) shouldn’t see them, why in the world are you not doing anything to stand against it? All abolitionists who are doing ministry work in the state of Florida need to be aware that some school officials are not aware that the 500 foot school safety zone (Statute 810.0975) does not infringe on citizens' First Amendment rights. The end of Section (2)(c) of Florida Statute 810.0975 reads as follows: "Nothing in this section shall be construed to abridge or infringe upon the right of any person to peaceably assemble and protest." This sentence confirms that the abolitionist who is conducting his/her ministry work in front of the public school on the public sidewalk is well within his/her First Amendment right to peaceably assemble and "protest." The abolitionist is (by definition) conducting "official business" inside the 500 foot safety zone. For those abolitionists in the state of Florida who are doing ministry work in front of the public schools, please follow this link to the official School Safety Zone Statute 810.0975 and print off several copies of it to always have on hand to offer to the school officials and school officers who have wrongfully told you to move outside of the school safety zone or who have wrongfully told you to move across the street, etc. Are Christians Guilty of Aggravated Child Neglect? "An Alabama man who was charged after a 4-year-old girl drowned in a Kissimmee resort pool last week did nothing to save her, Kissimmee police said in a report released Thursday. Genesis Harper died June 7 at a pool in the Coral Cay Townhomes. Police reviewed surveillance video from the pool that shows Elijah Darnell Morton, 28, just a feet away from Genesis as she splashed and struggled to stay above the water, Kissimmee Police spokeswoman Stacie Miller said. 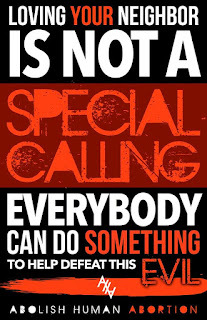 So often when I'm out doing ministry work to end America's Abortion Holocaust, Christians will say to me, "It's not my calling," or "That's not my gift." Well guess what Christians? It's NOT a "calling" or a "spiritual gift" to love your preborn neighbor—it's a command. The Bible is very clear on this. When Jesus was asked by the lawyer in Matthew chapter 22 which is the great commandment, He replied, "You shall love the Lord your God with all your heart, with all your soul, and with all your mind. . . . And the second is like it: You shall love your neighbor as yourself."